If naysayers whine about the newly reconfigured office space, their boss at the Broadcasting Board of Governors plans to remind them of its cutting-edge advantages as well as the fact that he himself volunteered to put his desk in the “worst” location, beginning Monday. Andre Mendes, the BBG’s director of global operations, recently escorted reporters through the construction zone of the ultra-modern open office space to which his team at BBG’s Office of Technology, Services and Innovation will soon relocate. The fourth floor of the Cohen building, a dank 1938 structure on Independence Avenue Southwest built for the Social Security Administration, has long offered a spectacular view of the Capitol dome and the nearby National Museum of the American Indian. Each employee—unless on the road or telecommuting—will enjoy a 70-square-foot work station with low partitions that facilitate sight lines and air flow, but provide noise-muffling padding. File storage space is handy but discreet in nooks between columns or combined with wheeled-seats that roll under desks. Each desk is fully Internet-linked with “enormous wireless bandwidth,” Mendes said, and with WiFi convenient for guests. On desks will be Microsoft Surface 3 tablets and “seamless” VOIP telephones that link to mobile devices and allow free phone calls to anywhere on the planet. The fresh carpeting, which is color-coded to differentiate between desk and conference areas, is removable in small pieces for ease of cleaning. Another key advantage is the eco-friendly LED light fixtures that users control and a centralized copier-printer-scanner. “We were spending a half a million dollars a year on printer cartridges, and we can’t afford it,” Mendes said. “We leapfrogged the technology by five years since we were hopelessly behind,” said Mendes, who has responsibility for the “widest portfolio of media in the world,” given the BBG’s range of equipment from acres of antenna to satellites to a social media presence that broadcasts in 63 languages. And that’s only the first phase, now nearly complete. 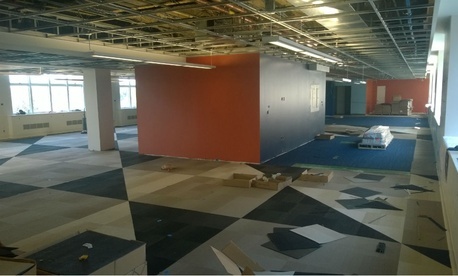 Phase 2, set for completion by January, involves the “collaboration rooms” that line the work-station areas. They will include 24 meeting rooms that can host four to 16 people, with adjustable dividers and whiteboards and lounge sofas as well as videoconferencing equipment and webcams. Nearby “personal care rooms” will offer privacy for such activities as personal phone calls, mothers’ lactation expression and insulin shots, and an employee café will provide common space for lunching. There are also adjustable stand-up desks and treadmills equipped with laptops to promote employee wellness. The whole fourth-floor plan will boost capacity from 80 desks under the existing design to 153, “an enormous gain,” Mendes said. The savings are projected at $2.6 million in fiscal 2015, and more in later years, from the $25 million BBG pays in rent to the General Services Administration. GSA, of course, is leading the governmentwide push for open office space, having pioneered it at its own recently renovated headquarters at 1800 F Street Northwest. GSA, in what Mendes thinks may be its fastest decision ever, came back the next morning and accepted, providing a top design company that delivered a plan BBG readily embraced within two weeks. Now BBG thinks it can sustain the gains for four or five years by expanding open space to other divisions, perhaps reducing the agency’s overall footprint by 20 percent to 25 percent in five years, saving $7 million or more, he said. Construction was not without glitches. The Cohen building “is not symmetrical, and there was a difference between the drawings on record and the site conditions,” as well as a tangle of old ceiling cables that had to replaced and aligned, said BBG project manager Jonathan Ward. But managers worked with the American Federation of Government Employees and other unions, and sought volunteer staff members with varying specialties to help choose the furniture and other accessories. Many will agree it’s an improvement over the old building, with its dark narrow corridors and walled-off offices that, Mendes stresses, “looked like a mental hospital in the former Soviet Union.” Anyone who objects to the noise in a collaborative arrangement is offered earphones, he noted, adding that low-height work-station partitions encourage people subconsciously to tone down their voices.